With its top class infrastructures, wonderful scenery and après-ski scene, Italy is a popular Winter destination among skiers, snowboarders, free-riders and aficionados of cross-country ski. Good skiing and winter sports can be found in at least five different regions of Italy: Piedmont, Lombardy, Trentino-Alto Adige, Veneto and Aosta Valley. Here is our selection of the top 10 best ski resorts of Italy. Madonna di Campiglio is certainly one of the best ski resorts of Italy. Located in the Dolomites (Gruppo di Brenta), in the Val Rendena, this small, friendly village is surrounded by a variety of mountains, very well interconnected with the ski resorts Marilleva, Folgarida (including with a new connection to Pinzolo), offering 150 kilometers of ski runs, up to an altitude of 2600 meters and with varying degrees of difficulty. The resort also offers good cross-country possibilities, with many charming tracks in the enchanting surroundings of Campo Carlo Magno. Selva di Val Gardena (short: Selva Gardena or Selva Valgardena), also known as Wolkenstein in Gröden, is located at the foot of the Sella Massif in Val Gardena. 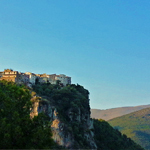 It is one of the three most important villages, together with Santa Cristina and Ortisei. Selva and Santa Cristina are attractive ski resorts, famous for their charming centers, good eating and après-ski entertainment and appreciated by connoisseurs who shun the more ‘fashionable’ ski resorts and are looking for more authentic places. 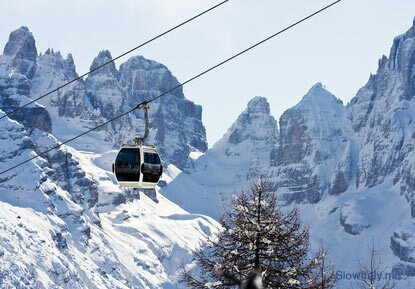 Selva and Santa Cristina are connected by the Ciampinoi gondola and are close enough to make up the largest resort on the Sella circuit with 175 of runs. With the Skipass Dolomiti Superski skiers also have access to all lift facilities surrounding the Sella Group, with 500 km interconnected slopes, and a total of 1.220 km slopes in 12 zones in the Dolomites. Val Gardena also offers many places for off-piste and cross-country skiing, as well as possibilities to go carving, telemark skiing, sledding, ice climbing and paragliding. The ideal position, cutting-edge lift facilities and romantic alpine huts make this a favorite destination among many winter sports lovers. Located in the Dolomites, in front of the famous mountain group called ‘Marmolada’, Corvara is the main village in the area known as the Alta Badia, one of the prestiguous ski race venues on the World Cup Circuit. The village itself is small and very authentic, one of the few places where the minority language Ladin (Ladino) is still spoken. In terms of skiing possibilities, it is simply fantastic thanks to the interconnection of ski slopes within the Dolomiti Superski Area offering access to 668 individual pistes, making it possible to ski from morning to night without repeating the same slope! Corvara itself offers 130km of ski runs and is directly connected by ski lift to the ski areas of Santa Cristina (Val Gardena). View over the Dolomites from Rifugio Boè, Piz Boè. Bormio and Livigno are two ski destinations located in the Lombardy region just beside the National Park of Stelvio. Bormio is a very small village, with a charming historic center, surrounded by several ski slopes of all types of difficulties. It is part of the Alta Valtellina Ski Area with access to 112 individual pistes. In addition to Bormio’s own ski runs (39km), the ski resort is also interconnected with other Alta Valtellina ski resorts, such as Livigno and Santa Caterina. All ski runs being above 2500 metres, skiing and snowboarding is assured throughout the season. Originally built as a thermal spa town, Bormio ski resort, with its modern thermal baths as well as a wide variety of bars, restaurants, night clubs and a cinema has developed into one of the most popular ski resorts in Italy. Livigno, sometimes referred to as the ‘Mecca for freestyle’, is only few kilometers west of Bormio. The Mottolino di Livigno is one of the most sparkling ski resorts of Europe, with its famous Snowpark, both for snowboarders and skiers, at an altitude of 2,400m, 700m long with four trails for all levels of proficiency (from S to XL, strictly reserved to highly skilled riders). While Livigno is not easily accessible – there are no highways or airport nearby – the ski slopes are always crowded, an indication of how popular a ski destination Livigno is. Some may regret that it is more known for its “shopping” after-ski and for people-watching, rather than for its excellent skiing possibilities. The town center is indeed very pretty, with the perfect balance between lively après-ski, fine restaurants, good bars and nightclubs. Probably one of the oldest ski resort of Italy, Cortina d’ Ampezzo remains one of Italy’s most popular ski resorts and certainly the one most preferred by the glamorous and famous people. 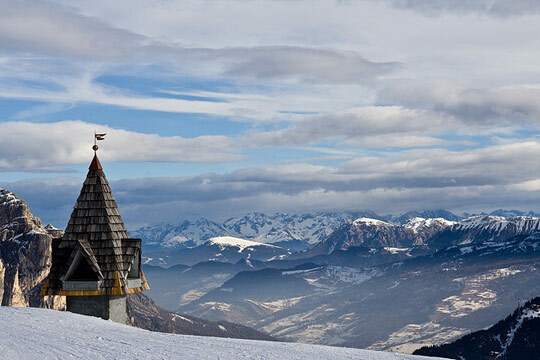 Set in a wide valley surrounded by beautiful and impressive mountains, the ‘Queen of the Dolomites’ is perhaps the most dramatic of any ski resort. No wonder that one of the memorable James Bond stunt sequences in For Your Eyes Only was filmed on its slopes, as were several scenes in Stallone’s Cliffhanger. 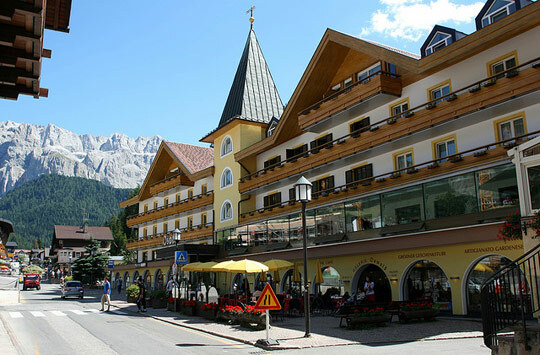 Cortina d’Ampezzo, as it is locally known, was also the host town of the 1956 Winter Olympics and of the 1927 Nordic, 1941 Nordic and 1941 Alpine World Skiing Championships. 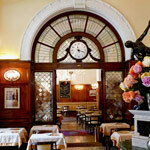 Known for its ski-ranges, scenery, accommodations, shops and après-ski scene, Cortina boasts an international atmosphere. 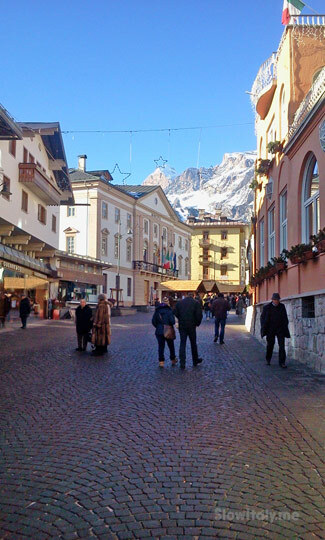 In the afternoon, people like to go window-shopping and people-watching in Corso Italia, Cortina’s main street. 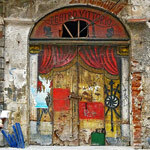 This pedestrian street is lined with the most fashionable shops, hotels, restaurants and cafes. There are five ski areas that make up the ski area of Cortina, from great long cruisey runs to the World Cup downhill course. 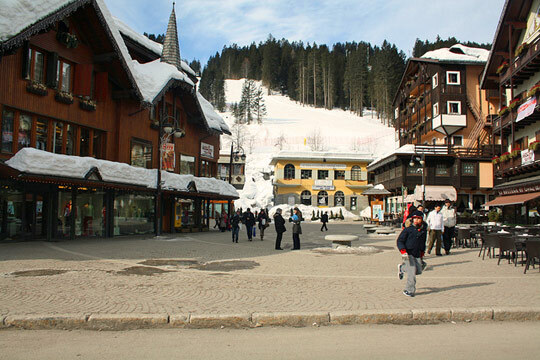 Cortina is also connected by bus with the Alta Badia ski area. For fans of cross-country skiing, the main centre is the Fiames Sport Nordic Center, but the resort also offers curling, snowkiting and extreme skiing. 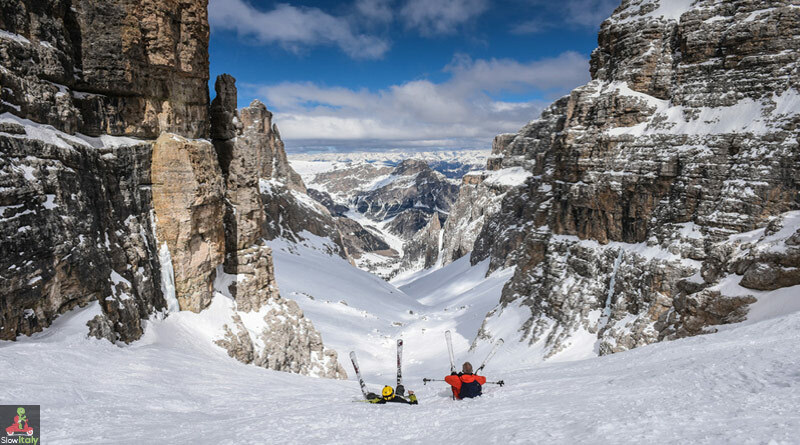 The new trend in Cortina is Slow Ski, a new (or long-forgotten) way to experience skiing which is all about taking your time and savoring the moment. 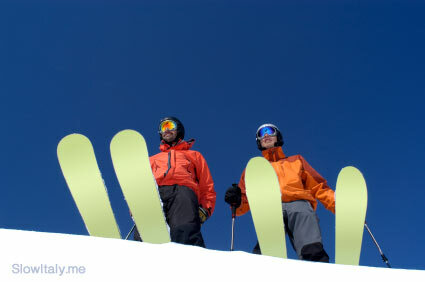 THE place to be for Slow Ski is Faloria, which dedicated one of its most scenic slopes, the Vitell piste, to slow ski. Cervinia (Breuil) is located on the Italian side of the Monte Cervino and shares a ski area which stretches through three valleys in two countries, Italy and Switzerland, from the 3,883 m of the Piccolo Cervino descending to the 1,524 m of Valtournenche in Italy and Zermatt in Switzerland, all accessed from the same lift system, making this area one of the largest in the Alps. It is possible to pay a daily supplement or buy a more expensive weekly pass to access Zermatt, but don’t forget your passport! The sunny, snow-sure slopes offer 350km of ski runs with 69 runs in Breuil-Cervinia Valtournenche, and 78 runs in Zermatt of increasing difficulty – 57% red, 23% blue, 20% black -. The longest one covers 22 km going from the Klein Matterhorn (in French, Petit Cervin) in Switzerland down to Valtournenche in Italy. Host of the Turin Winter Olympics 2006 snowboarding competitions and the European Cup and World Cup competitions, Bardonecchia has become an internationally renowned snowboard resort that continues to welcome all snowboarders who are attracted by the extensive facilities of the resort. From the Olympic halfpipe to the well-equipped snowpark, from the extensive network of pistes to the off-piste and free riding opportunities the resort certainly offers a wide range of runs for all rider levels and preferences. First-time snowboarders or riders who want to perfect their style and technique can meet with national instructors and trainers who work for the schools in Bardonecchia. The novelty of the 2011/2012 season is the new panoramic slope of Jaffereau, where you can enjoy a breathtaking view of the Val di Susa and the valley of Bardonecchia. In the Jafferau area skiing is mainly at a high altitude (the highest point is 2807 metres). 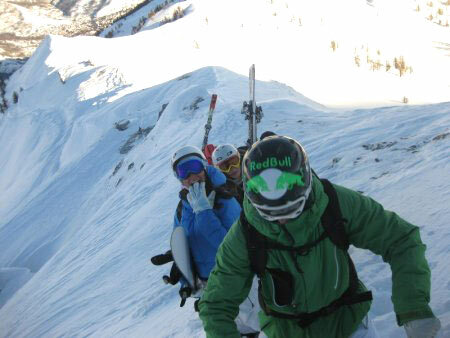 The scenery is breath-taking with many off-piste opportunities. When skiing off-piste it is always essential to be aware of the risks of avalanche, so remember to contact the various ski & snowboard schools or the Alpine guides for further information about avalanche risks or to organize guided tours in complete safety. 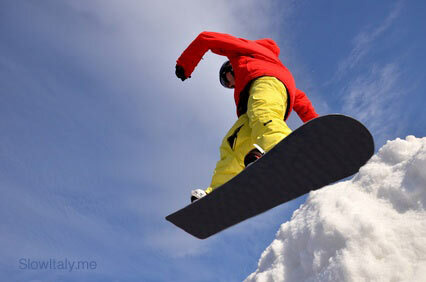 Bardonecchia Snowpark is situated in the area of Melezet and has a vertical drop of 1100 metres. The snowpark has been designed to provide for different needs and different levels of snowboarders: from professional riders to first-timers. Within the park itself there are a range of structures differing in size and dimension. It consists of a number of dedicated areas including one for jumps and artificial structures, plus another one which houses the Olympic Halfpipe, an imposing structure which is 130 metres long, 18 metres wide and 6 metres high, the only Olympic halfpipe in Europe! Sestriere, the most famous resort located in the Vialattea ski area, is located in a beautiful natural setting, formed by peaks and plateaus at over 2000 m of altitude. It is connected to 146 skiable pistes, for a total of up to 400 km of trails, of which 120 are provided with artificial snow, and 66 ski lifts. Together with the villages of Pragelato, Claviere, Sauze d’Oulx, Cesana Torinese and San Sicario, and Montgenèvre in France, it makes up the Via Lattea (Milky Way) skiing area. The most interesting ski tracks are the Kandahar Banchetta Giovanii Nasi, which connects Motta to Borgata, Fraiteve, Sises, Rio Nero. Not to mention the off trail skiing in Val Troncea, and the innumerable hiking trails at the edge of the slopes definitely which make the Conca del Sestriere one of the most popular ski resorts throughout the Alps. Passo del Tonale is a high mountain pass in northern Italy across the Rhaetian Alps, between Lombardy and Trentino, connecting Valcamonica and Val di Sole. It is delimited by the Ortler Alps to the north and the Adamello range to the south. The pass plays host to many hotels and shops for tourists in the winter, as the land around the pass is used for winter sports – mainly skiing (Adamello Ski Raid) and snowboarding. Passo Tonale is one of Italy’s highest resorts, with an altitude from 1884m to 3100m. Good snow and a long season are guaranteed, but it can get quite chilly in Winter. The slopes are mainly suitable for beginners and lower intermediates, which makes it particularly popular with young families. Passo Tonale is linked to Ponte di Legno in Alta Vallecamonica and with the Temù slopes which are more suitable for experienced skiers. The Folgarida-Marileva resort offers an impressive 880 meters of vertical descent with some of the most challenging black runs of the Brenta Dolomites and lots of red and blue runs for a total of 150km, served by 54 lifts. Folgarida and Marilleva have been entirely created for skiing. Here you can get up, get on your skis and keep skiing until night, coming down on the Monte Vigo along the illuminated trails. The skipass Superskirama Dolomiti Adamello Brenta offers access to the entire Trentino west ski area and to Pinzolo, Madonna di Campiglio for a total of up to 380 km. There are also 47 kilometers (29 miles) of cross country ski trails at Folgarida. Photo credits: Snowboarder © Muro; Madonna di Campiglio © Nikolai Korzhov; Madonna di Campiglio by ItaliaABC; Selva di Val Gardena by philipbouchard; Two telemarkers © Michele Galli; Piz Boe by changó; Cortina © Slow Italy; Snowboarders at Bardonecchia courtesy of Bardonecchia Tourist Board; Happy family in the snow © Wojciech Gajda. greetings, many thanks for blogging about snow skiing in Italia. 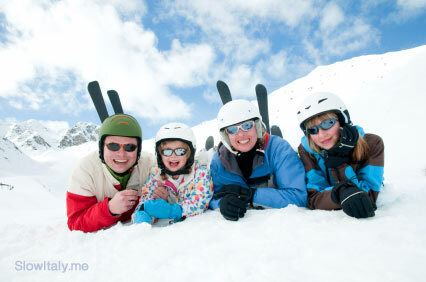 In Tuscany we own a well-known ski-resort called Abetone, where families go from December through to April to enjoy the ski slopes once made use of by Italian skiing superstar, Zeno. Come and see what makes Tuscany a wonderful spot to ski, and many thanks for your blog post! i loved the skiing and scenery, it is wonderful and comforting to go on holiday to a foreign destination to find that everything is organized and that if you need assistance you have it on hand.